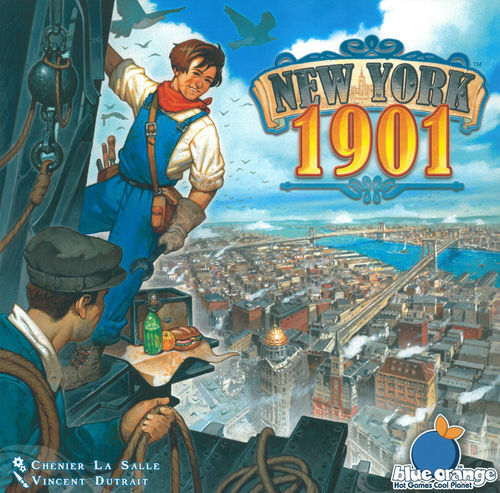 New York 1901* is a family board game for two to four players (and plays well across all counts). You’ll be claiming lots across Manhattan, then building your skyscrapers on them to score points. While it has some similarities to Ticket to Ride this is a small step up in complexity from that classic gateway game, but should appeal to a broadly similar audience. The game retails for around £30, which is solid value. You get a large board, 80+ linen-finish cards (mostly small-sized), 80 chunky cardboard skyscrapers and 20 plastic pieces (4 workers and a nice skyscraper score marker per player). As with Ticket to Ride, the box claims the game takes 30-60 minutes and is suitable for ages 8+. While I do think an eight-year-old could play the game, it’s not cut and dried that they’ll enjoy it – see ‘key observations’ below. As for length you can get a game played in an hour, but I’d put that at the shorter play length rather than the longer. 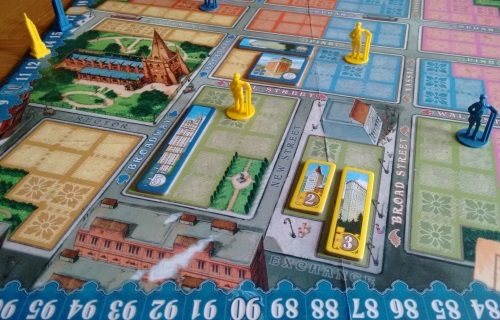 New York 1901 is a pretty simple game to teach and there is no hidden information, so it’s also simple to help less experienced players through the early rounds. 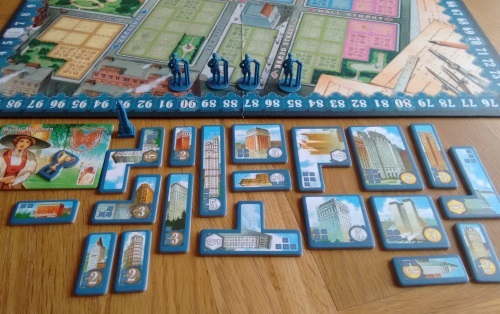 Each player has identical starting pieces, except for colour: four workers, 19 skyscraper tiles and a character card. Annoyingly, while you can choose your player colour (yellow,green, blue or – you guessed it – brown…) your character is given to you at random and may or may not be the same colour. It is only used to determine your start position (you start with a small building on the board), but may cause some initial confusion. Similarly the board is divided into sections that are green, blue, red, yellow and pink – which again do not have anything to do with player colours. This again may cause some initial confusion, and it’s hard to believe there wasn’t a better solution – but it doesn’t get in the way of the overall fun of the game once you get going. Your skyscraper tiles are pleasingly Tetris-like pieces, from small two-piece buildings to far bigger eight-piece structures, which come in all kinds of shapes and sizes. There are also a few big, legendary skyscrapers which each player can build one of, that add nicely to the theme. Play goes clockwise, with each player choosing one of two actions on each of their turns: claim/build, or demolish. ‘Claim’ sees you take one of the four face up lot cards and place a worker on a matching lot on the board (lots are either two or three spaces and the card has to match both size and colour). Build sees you remove a worker/workers and cover the lots they were on (not necessarily completely) with one of your skyscrapers. You can do either or both of these as your action, meaning you can place several workers over a succession of turns in order to then place one larger skyscraper. However you decide to do it, when you do build a skyscraper you immediately score its value as printed on the tile. 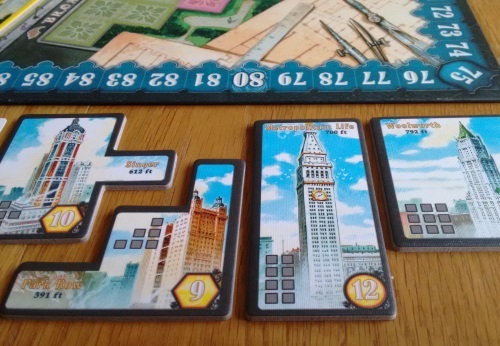 Each player has identical bronze, silver and gold skyscrapers representing the progress through the ages of the city. The score track has several markers along it showing when each player can start to build the next level of building – so at first you can only build bronze, until you pass the silver mark on the score track etc. ‘Demolish’ simply sees you upgrading older buildings with newer ones, again scoring points as they’re played. It’s important to remind players early on that they can’t combine these actions: so you can’t demolish an old building and also place a worker next door to place a large structure – but you could replace both with one ‘demolish’ action if the worker was already on the board**. On this note, do tell people to use their small two-piece buildings wisely. Running out of these early can seriously hamper your building plans later once the board starts filling up and players start to get more competitive. Similarly, it’s worth reiterating that you can’t demolish a building and replace it with one of the same level – but you are allowed to demolish a silver and a bronze and replace them with a gold. You don’t have to step up one tier at a time, but you do have to step up. You can also build anything with a worker, as long as you’ve opened that tier of building. When the card deck runs out, or when one player has just four unplaced skyscrapers left, the game end is triggered and bonus points are added (see below). And that’s that. The writer: New York 1901 is quite simple, but four random bonus cards make each game a little different. Three of them are street names, adding an area majority element. You try to have the most buildings on each of the streets, with five bonus points going to the winner of each. In a game where 70 is a good score this is a good amount of points and it adds an extra later of thought to your placement. The fourth card is one of five, each adding a very different way to score more points but always making the game a little more puzzley. The thinker: While an enjoyable enough family game, I found it a little too chaotic and luck driven: if you don’t see the cards you want, you’re simply scuppered and there’s little you can do about it. But with two the game is much better: one colour of card is removed, limiting the luck a little, while the battle becomes more chess-like as you try and out manoeuvre each other for the bonuses. It’s still too light for me, but I’d certainly play it ahead of Ticket to Ride or many other family games. The trasher: This may look like a cutesy family game, but New York 1901 has plenty of room for screwage. You can see everyone’s workers and remaining buildings, as well as how they’re doing for bonuses; so it’s easy to see what they’re looking for in terms of lots and then snap them up to spoil their plans! Each player also has three cards which allow one double build, one double lot card grab and one clearance of the available cards to see new ones – all of which can be invaluable in either screwing or avoiding being screwed. In Ticket to Ride you often screw people by accident – here it is very much ‘game on’! The dabbler: The bright colours, whimsical art and Tetris style buildings make this a lovely game to look at; and despite the blocking nature of some players I very much enjoyed it – you just need to pick the right crowd to get the right atmosphere. We used some Ticket to Ride trains to mark which where the bonus scoring roads were as that helped everyone remember; and it’s a nice touch that the skyscrapers have handy markings on them showing you how many spaces they cover, as for those who aren’t so spatially aware it’s not always obvious. 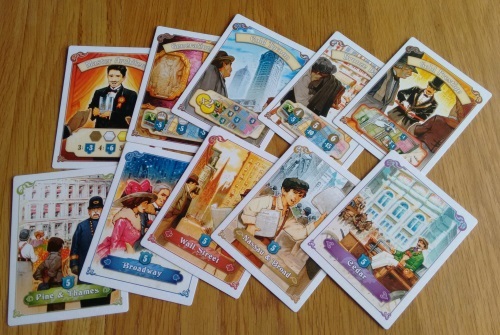 When it comes to talking about New York 1901, it’s impossible to overlook comparisons to Ticket to Ride; from the character art style to the randomness/style of the card draws to the game weight. But in truth they’re slightly different animals. While both are family games I’d put NY1901 above gateway level, simply because you’re not secretly being led down a path by the game (as you are in TtR by the route cards) and the full game – and every score – is right there in front of you to math out. I’ve never seen Ticket to Ride cause brain freeze like this baby can. For me, this is New York 1901’s only real fault: as the game nears it’s conclusion it doesn’t have those secrets – that ‘counting the big points off the cards’ moment. While on the flip side, the lightness and luck mean people who don’t enjoy Ticket to Ride probably won’t be swayed to like this game either. And there are some other minor niggles. It’s hard to see how you’d want to be anything but start player, as not only do you get first placement there is likely to be an uneven amount of turns each. But those going later in the order get no compensation. It keeps it simple, but it seems a little mean. Another odd one is what passes for an advanced version of the game; where you can’t start to build silver skyscrapers until you’re on 10 points instead of six. I just can’t see why you’d play with the lower number at all – it actually seems better to encourage new players to use the big scoring bronze buildings earlier to try and get 10 points, as it alleviates the chances of them burning all their small buildings too early. Or maybe we just don’t play mean enough. Finally, there is a bit of difference in play between player numbers but it works very well. With four the board is definitely at its tightest, while with two and three it’s a little looser – though with two you don’t use the pink section of the board, making it akin space-wise to the three player game. But in truth the extra space doesn’t mean too much, as the real battles will tend to be along the streets with the bonuses. While New York 1901 isn’t without its faults (what game isn’t? ), I think it’s the closest a game has come to knocking on the door of the big boys for a long time. While I can’t see it knocking Ticket to Ride off its perch – and nor do I think it deserves to – it’s a game I do think is fit to sit alongside it and the likes of Carcassonne and Catan. Sure, there’s luck of the draw – but do I think the better players will win most games? Absolutely. And will be people get struck with analysis paralysis? they certainly will. But in the majority of games I’ve played, those AP people have actually said they enjoyed the game afterwards. If you like Ticket to Ride, or other games of that weight, I’d certainly urge you to give New York 1901 a try. It’s reasonably priced, beautifully produced, plays in around an hour and is simple to teach. It will definitely be staying on my shelves for the foreseeable future. ** This is not made clear in the rules – please see these amendments from the designer.